But it seems that it's all been resolved, and NASA money was not really wasted. Jason-3 has been delayed again and none of the delays are due to the spacecraft. Phil, what was the source for that timing table? I don't see it at the link QuantumG left. A delay to ISS scheduling is not the end of the world, it is simply an inconvenience for NASA and a whole bunch of other people. It happens anyway due to many reasons. OTOH, a loss of a stage that contains valuable data is a bummer for SpaceX. It is not an inconvenience, it is a large cost to NASA and its partners and if it can be avoided it will. Just because a delay "can" happen doesn't mean it should. Spacex can test its stages on its own dime and not wasting NASA's. I don't think that it will be done for this flight but NASA could negotiate something in exchange for their trouble (extra data that is useful to them, improvements to cargo Dragon, etc.). But given the fact that SpaceX's ultimate goal is a return to the launch site, they may not be willing to barter much in exchange. Just hoses and a tarp. This picture shows holes below the yellow I-Beams. This is against the theory flooding the deck. What is to see: this is a heavy construction. Rope could tied on it (see the right side). The surface of the deck is smooth and pure metal. Sticking friction is low. My opinion gets stronger: this is against a slipping rocket - of course in a case of medium wawes causing some slowly slippage of the core (if the thrusters cannot compensate enough). See this video about a more extreme situation to explain what I mentioned above. 1. Flooding the deck would be a bad idea for several reasons... but, yes, the presence of those scuppers certainly rules it out. 2. It doesn't seem like slippage is an issue on their radar. 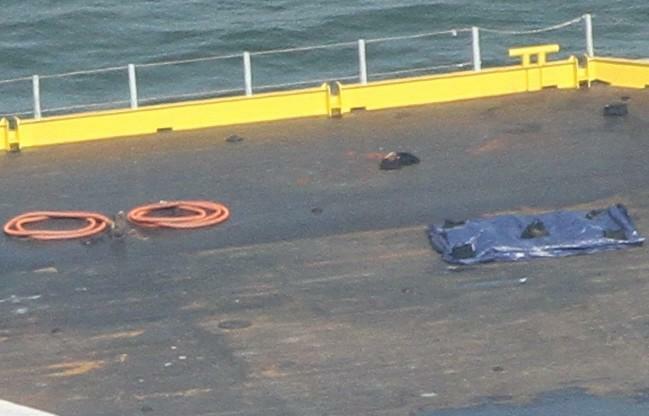 From info posted in other threads, it appears SpaceX have set a range 'go/no go' limit of 6ft on wave height for landing (ie. virtually flat calm for a barge of this size). If the sea is rougher than this, presumably they'll ditch (sorry, "land") in the ocean nearby. I believe that in the pre launch conference they were positive that they could handle much larger waves than 6ft, but i dont have an exact quote now. Just because they're positive they can, doesn't mean they will in practice. You need to set the limits somewhere. Based on Center of Gravity of the landed stage, they would have figured that out. Welding keepers to the deck surface to secure the stage's feet greatly aids in keeping it stable. The only difference is between landing and transport. Landing is much more critical, as you could 'theoretically' have the stage topple over if one leg touches as the deck surface pitches up in a hurry. or it could skid across the deck surface. Go Quest is coming home according to the latest vesselfinder info. Elsbeth III info has not been updated. Its moving at 8kts so i dont think they have the ASDS with them. It is probable that Elsbeth III is staying with the ASDS around the landing zone. Latest track suggests ElsBeth3 is also on her way to port. interesting that they are separated and traveling at different speeds. perhaps Elsbeth went to tug asds and GO went on to shore without them? did anyone tabulate the travel time from port to landing site? maybe like a day and a half? seems like theyll be cutting it close if all theyre doing is going in to refuel or something and then turning back around. possible theyve been communicated that the second stage problem will take a while to diagnose a fix? interesting that they are separated and traveling at different speeds. perhaps elsbeth went to go tug and go just went on without them? Whatever they're up to, it would make a lot of sense to leave the ASDS out there. Maybe the Elsbeth III hung around a bit just to make sure it was ok? I guess we'll know when they get back to port. Attention on deck! This is your moderator speaking! We're drifting. Engage thrusters and return to the topic please. Further off-topic posts may be hulled and sunk without a trace, all hands lost. As you were, that is all. Vesselfinder says the Elsbeth III was about 110 km offshore at 9:17 UTC. At around 5 knots, that's about a 12 hour trip back to port, arriving around 4:00-4:30 ET this afternoon. What is the expected sea state at the planned ASDS location on Friday? Is it possible that SpaceX has decided not to make the landing attempt due to high seas, and instead wait for a later launch for the first try? Weather doesn't look too bad. Winds 15 kts, waves 6-8 feet. Isn't 6 to 8 feet over the limit of 6 feet? It's not known to be a "limit". It is a criterion. What SpaceX does with that information, should the sea state exceed that level, is not known.